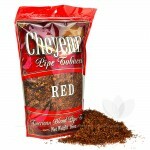 Cheyenne Filtered Cigars and Pipe Tobacco focus on delivering unbeatable value without compromising on flavor and quality. Each bag and carton is filled with the highest locally sourced pipe tobacco available to deliver an unmatched, high quality experience. Tobacco General offers the largest variety of Cheyenne Cigar and Tobacco flavors and products at the lowest possible prices. 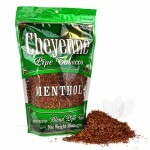 Available Cheyenne Pipe Tobacco flavors include: Red (Regular), Gold (Smooth) and Menthol. Along with Pipe tobacco, we offer the biggest line up of Cheyenne Filtered Cigars on the market, in the following flavors: Full Flavor, Classic, Menthol, Extreme Menthol, Wild Cherry, Sweet Tip, Vanilla, Grape, Peach and Xotic Berry. Cheyenne filtered cigars are perfect for those seeking a taste on the stronger side of the flavor spectrum. These filtered cigars offer a simple draw and are very easy to light. When doing reviews on this brand, all reviews drew positive feedback and no cons when the smoker’s choice was put to test based upon the simplest qualities a cigar must possess. 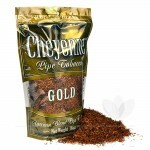 The American-grown tobacco found in Cheyenne filtered cigars is simply unsurpassed in its class! Tobacco General offers a wide selection of Cheyenne cigars with flavors including full flavor, peach, Xotic berry, light, vanilla, grape, menthol, wild cherry, extreme menthol and sweet tip. Tobacco General offers extremely affordable prices on all Cheyenne filtered cigar flavors while guaranteeing that these Cheyenne cigar products will be of great quality! Try it now! A full-flavored traditional tobacco blend. Smooth and Mellow with a medium and even cut. High quality menthol flavor and a smooth and full-bodied tobacco. Cheyenne International introduced this line in 2004, with a homogenized wrapper and short-fill, American-grown tobacco inside. 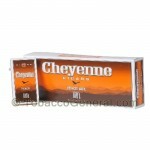 Cheyenne Light Cigars are available in a wide variety of flavor that makes any tobacco break enjoyable! Get a Cheyenne Light Cigars today. Cheyenne International introduced this line in 2004, with a homogenized wrapper and short-fill, American-grown tobacco inside. 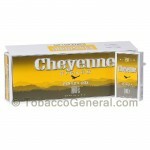 Cheyenne Vanilla Cigars are available in a wide variety of flavor that makes any tobacco break enjoyable! 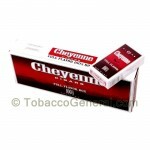 Get a Cheyenne Vanilla Cigars today. 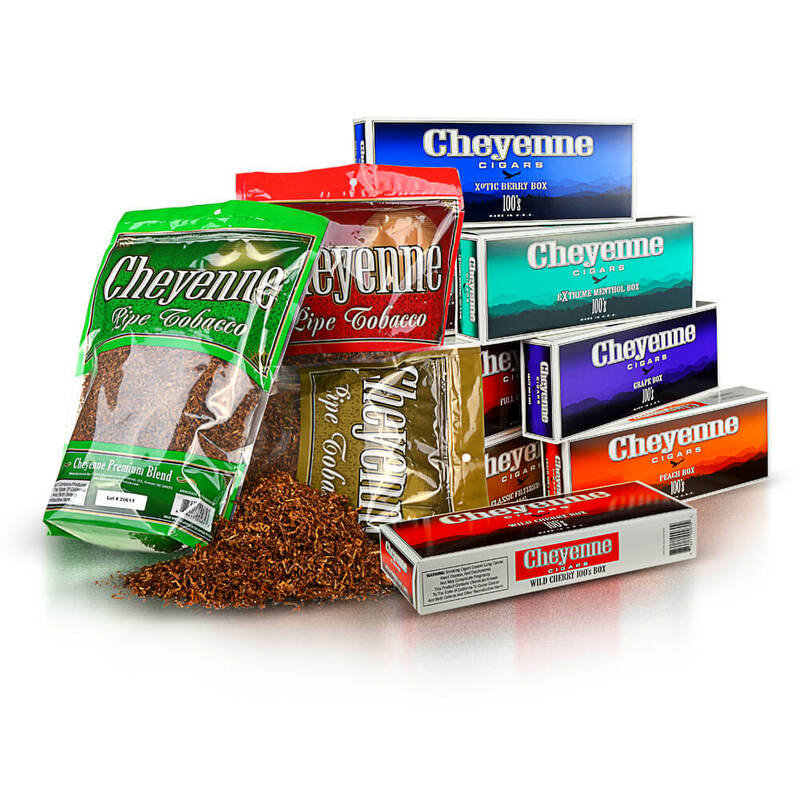 Cheyenne International introduced this line in 2004, with a homogenized wrapper and short-fill, American-grown tobacco inside. 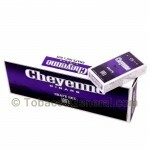 Cheyenne Grape Cigars are available in a wide variety of flavor that makes any tobacco break enjoyable! Get a Cheyenne Grape Cigars today. 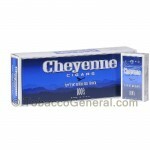 Cheyenne International introduced this line in 2004, with a homogenized wrapper and short-fill, American-grown tobacco inside. 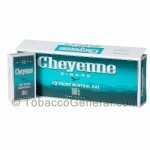 Cheyenne Menthol Cigars are available in a wide variety of flavor that makes any tobacco break enjoyable! 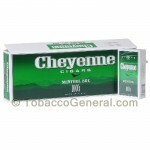 Get a Cheyenne Menthol Cigars today. Cheyenne International introduced this line in 2004, with a homogenized wrapper and short-fill, American-grown tobacco inside. Cheyenne Wild Cherry Cigars are available in a wide variety of flavor that makes any tobacco break enjoyable! Get a Cheyenne Wild Cherry Cigars today. Cheyenne International introduced this line in 2004, with a homogenized wrapper and short-fill, American-grown tobacco inside. 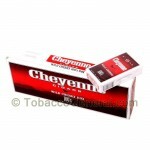 Cheyenne Sweet Tip Cigars are available in a wide variety of flavor that makes any tobacco break enjoyable! Get a Cheyenne Sweet Tip Cigar today. This one is a wildcard. You either love it or hate it, and theres no way around it. Pineapple has a strong flavor which some might consider overpowering. Taste with caution. A fantastic tasting cigarillo with a strong and sweet taste of white grapes. Works as an everyday smoke, or as a treat for yourself. Either way, you can't go wrong with this flavor. A delicious blend that will be familiar to most. The Sweet blend features a rich and consistent burn with the familiar sweetness that everyone loves. One of the most popular flavors. This flavor is more on the complex side. It's robust yet somehow still mellow. Although the flavor is confident and always on the frontlines it somehow manages to stay really light and smooth.